The decision of studying abroad is an exciting one! Understanding that our students are miles away from their families and home countries, J. Addison staff endeavor to provide a safe, comfortable and nurturing living environment which they can call their home away from home. Our Boarding Program is available to students in Grades 7 – 12. Residence Life provides students with valuable experience in becoming independent and responsible young adults. Living with peers encourages social interaction, which in turn strengthens their interpersonal communication skills; thus, improvement of emotional intelligence. Close friendships flourish frequently, which students can cherish and cultivate for the rest of their lives. In-dorm events and excursions will allow students to experience Canadian culture, and most importantly, a feeling of belonging. 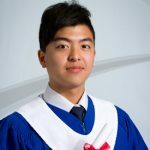 We have a dedicated team of compassionate and knowledgeable residence counsellors providing care and guidance to all boarding students, from personal counselling, to academic support and community activities; also, safeguarding the interests and safety of our students through regular communication and meetings with parents and guardians. Our goal is to cultivate and foster a vibrant learning community, one which allows students to live, laugh, and learn in harmony, safely and securely; and, to truly experience the Joy of Living! Why J. Addison Boarding School? 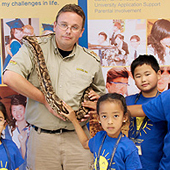 The Student and Residence Life Program is one that promotes academic and personal development at J. Addison School. There are four key factors that influenced the design of the program, they are the Emotional, Social, Physical and the Mental Well-being of the student at J. Addison School. Students within J. Addison Boarding School are able to be educated through various school-oriented workshops and presentations on issues such as bullying, peer-pressure, stress management and healthy expressions which coincide with the subject of Emotional Factor. 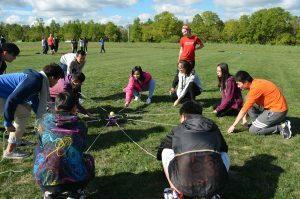 With regards to the Social Factor, students are able to participate in leadership and community building activities where they learn the importance of team work, collaboration and effective communication. More importantly, students are able to participate in outdoor field trips that enhance leadership, and team building activities such as leadership retreats, volunteering retreats, team building events and entertainment events. The aspect of Physical as another factor allows students to be active participants in competitive sports during the school’s open gym for boarding students on Mondays, Thursdays, and weekends. Our residence counsellors also organize sports tournaments such as basketball, badminton, table tennis, dodgeball and many more. Lastly, the Mental factor hinges on our unique "Focus for Success®" adaptive program, where students can receive free tutoring and academic assistance from qualified teachers. 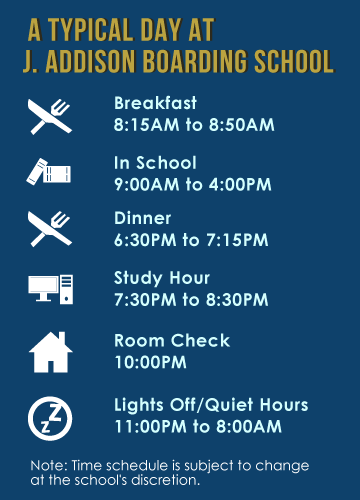 All boarding students have the opportunity to study hours each day where they would need to complete assignments, study, and receive additional academic support if needed from a live-in residence staff. We are here to provide structure for the boarding students and assurance to the parents that their child will develop healthily and actively, and to becoming determined individuals who are eager to succeed in their academics and extra-curricular lives. As part of an all-rounded education program to further encourage the development of belonging and citizenship, J. Addison School has established the Residence Leadership Team which is a student governing body within the residences at J. Addison Boarding School. Each year, a group of students are selected by professional staff based on their leadership, communication and interpersonal skill potentials. These students will be responsible in developing student-led residence programming, residence monthly newsletter, and discussions surrounding school policies. In turn, the students will be earning volunteering hours and receiving professional development and networking opportunities. The Residence Leadership Team is an amazing way for students to be involved within their communities, and gives them hands-on experience in representing other students to voice their opinions, and applying critical thinking and problem-solving skills in real situations. Erie Hall and Simcoe Hall are both co-ed residences with open concept shared rooms that hold 2-4 students. Students will have their own area furnished with single bed, desk, chair, and closet. Each room has its own bathroom. Only students of the same gender and of similar age will be assigned to live in the same room. Huron Hall is currently an all-male residence featuring compartment concept shared rooms that hold a maximum of 5 students in each sector. Students will have their own private cubicle furnished with single bed, desk, chair, and closet. The partition design provides an extra layer of privacy but still offer the benefits of communal and social living. Every room in our residences is equipped with a shared bathroom. Each residence hall is also equipped with a student lounge, kitchenette/snack preparation area, and self-service laundry room. Most importantly, they are monitored and secured with state-of-the-art security systems in addition to 24/7 staff supervision. While preferences will be taken into consideration, room assignments are determined at the school’s discretion. To ensure boarding students a worry-free environment so they are able to perform optimally in their studies and have a healthy school-life balance, J. Addison Private Boarding School is fully equipped with all necessities and offers a wide range of services. - 24/7 security systems for monitoring and access control. - Students will have his/her own single bed (mattress, pillow, bed linen and blanket are included), individual study desk, shelf and closet. - Every shared dorm room has its own bathroom. Students will only share a room with others of the same gender and similar age. - Central heating and air conditioning throughout. - Fully equipped with WIFI and telephone services. - Common spaces include recreation rooms, a study hall, kitchenettes, self-service laundry rooms, additional storage areas and more. - Live-in staff available on campus at all times. - 3 nutritious meals served daily, of an international variety. - Organized weekend trips, excursions and on-campus activities. - Regular in-room cleaning and maintenance of all residence properties. - Arranging medical attention as needed. - Academic support during evenings. - Complimentary airport pick up on students’ first arrival in Canada (at least 1-week advance notice required). At J. Addison, we believe a healthy balanced diet plays an integral part of student success, as nourishment affects their daily performance and development. With this in mind, our experienced chefs meticulously design and prepare meals 7 days a week, ensuring a wide range of flavorful global dishes which follow nutritious guidelines are served. Boarding students will enjoy their breakfast, lunch and dinner at the school’s spacious and hygienic cafeteria, conveniently located inside the main school building. We organize all types of activities regularly to engage our students to help them adjust to a new living environment as well as to assimilate into a new culture and community. Some of the activities include new boarder orientation, monthly birthday parties, shopping days, weekend trips to visit Canadian historical and cultural attractions, sports games and so much more! At J. Addison School we provide a holistic care approach in making sure that your child is being well taken care of academically, personally, socially, and more importantly, financially. The "Student Pocket Money Disbursement Program” is a service offered by J. Addison School Financial Department to safeguard that the student spends an allotted amount of personal money on a monthly basis, stipulated by the parent or assigned guardian. Once the school receives the amount stipulated by the parent, the funds will be distributed to student as per the parent’s instruction. The student and a witness will sign the receipt each time money being released to the student. The administration fee of the “Student Pocket Money Disbursement Program” is $100.00 (one-time fee) that must be paid in full before service commences for the student. This administration service fee covers a 10-month period. All payments are to be made in cheques, bank drafts, money order or certified cheque. Please specify student name on all form of payments.